A musical that’s a bloody delight; Scarborough Music Theatre, a community theatre troupe serving the Scarborough area since 1963, is presenting Sweeney Todd for the month of February at the Scarborough Village Theatre. For anyone who’s a fan of the play or who has only seen the movie adaptation starring Johnny Depp and Helena Bonham Carter, this is a performance not to be missed. If this is your first time and you happen to enjoy exceptional young musical talent and well-orchestrated music, then tuck into one of Mrs. Lovett’s meat pies or make yourself comfortable in Sweeney’s barber’s chair for the closest shave you’ll ever experience and prepare yourself for a demonically good time. Sweeney Todd is a musical that made its Broadway debut in 1979 written by Stephen Sondheim with libretto by Hugh Wheeler based on the 1973 play by Christopher Bond. The period is 19th Century London,England and follows the life of barber Benjamin Barker, now known as Sweeney Todd (Andrew Mitchell), who has returned to London after 15 years sentenced to a penal colony on false charges. Upon his arrival he learns that his beloved wife Lucy poisoned herself after being raped by Judge Turpin (Jason Silzer), the same judge who sentenced him. Judge Turpin has also taken in Sweeney Todd’s daughter Johanna (Emma Burke-Kleinman) as his own ward with plans to marry her. 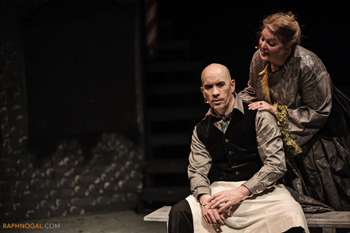 Sweeney befriends Mrs. Lovett (Laurie Hurst), a pie maker who has taken up business in the downstairs area of his old barber shop. The two conspire together to help Sweeney exact his revenge, luring unsuspecting men to his barber’s chair for a uniquely close shave while coincidentally providing Mrs. Lovett a delectable new filling for her meat pies. Joining me again on a snowy frigid night out was my housemate Sara who once dressed up as Mrs. Lovett with her then husband as Sweeney Todd one year for Halloween, labeled meat pies in tow. One thing that clearly stood out for both of us during this performance was the caliber of vocal talent from the cast. Sara developed a growing fondness for Matthew Hyslop, the young lad who played Anthony, and I was absolutely blown away by Mitchell’s Sweeney Todd – the enthusiasm and dynamism that he brought to the character, the power behind his vocals and the sheer insane delight behind his eyes as he made his slicing kills, blew me away. Admittedly, my only exposure to Sweeney Todd was the movie where Helena Bonham Carter played Mrs. Lovett and though I adore her works, I always felt her voice was slightly weak and lacking for a proud role like Mrs. Lovett. Keeping that in mind, Hurst’s bold and strong voice did Mrs. Lovett’s role pure justice. Incredible! The performance Sara and I attended was their opening night and allowances are usually made for odd hiccups to occur, but we both gave high regard for the diligence and strength in this cast and crew. With additional unscripted drama coming from the numerous fire alarm interruptions throughout the production, first during intermission and twice more after “God, That’s Good!” in Act 2. The cast never faltered standing outside in the snow and freeze, the ladies hiking up their skirts, huddling together for warmth and hopping back and forth trying to keep their performance shoes out of the snow. Back inside, interruptions forgotten, the cast continued with their performance without a hitch. The multiple interruptions that left cast, crew and audience standing outside in the cold waiting for fire fighting assistance quickly overshadowed the other minor opening night hiccups in the beginning of the first act. There were a few instances when microphones popped or had volumes lowered, and some scenes with a few props missing so actors had to mime. These were quickly fixed and easily overlooked. One slight disappointment for me – and it may only because I was anticipating how they would pull off the kill scenes of Sweeney’s barber chair victims – but the kills during the performance seemed a bit anticlimactic for my tastes. I was, however, delightedly amused in particular by watching the beginning of Act 2, again during “God, It’s Good!” and noticed the little girl no older than 10, Aly Van Wyck-Smart, who was part of the ensemble and also played the young Johanna, appeared to be sipping from her own ale tankard in the pie shop while the ensemble danced and sang around her. She was later sprawled on the floor, possibly taking a nap, with Mrs. Lovett needing to step over her during her solo. I think the little one may have had too much. This is a production that is deliriously funny and deliciously twisted, an exquisitely executed romp that will leave you toe tapping and singing along. A perfectly bloody Valentine treat that reminds us all that revenge is a dish best served piping hot in a flaky crust. Sweeney Todd: The Demon Barber of Fleet Street is playing at the Scarborough Village Theatre (3600 Kingston Road). Performances are February 7-9, 14-16, 21-22 at 8 pm with matinee performances on February 10, 17, and 23 at 2 pm. Tickets can be purchased by phone by calling 416-267-9292 or online at the Theatre Scarborough Box Office. Photo of Andrew Mitchell and Laurie Hurst by Raph Nogal.